'Mancub' is a bold and funny play about the perils of adolescence. It tells the beautiful and absurd story of a boy who seems to be turning into animals. Paul faces the usual struggles of growing up. He struggles for understanding with his father, and struggles to work out what girls are about. But he also faces a more pressing problem. Strange things keep happening, and they are getting stranger. Reality seems to be shifting. People are looking at him in a different way. Does Paul really turn into animals, or does he only think he does? Mancub was my first opportunity to try out lighting design and programming. And I probably couldn't have chosen a more complex play to jump into the deep end with. For this manically fast play that changes character and location every other second, I created a bold, dynamic, lighting design to help the audience figure out where they are, and to push the pace to near-absurd heights. For the quieter scenes, the mood was set by 84m of fairy lights entwined into tree branches covering the entire ceiling, creating a beautiful night sky. 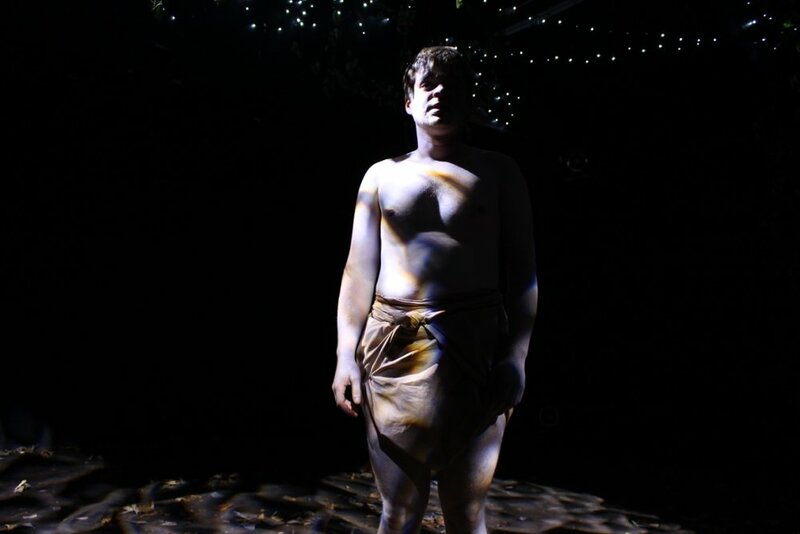 "It is rare for a creative performance to be considered flawless, but the Drama Barn’s rendition of Mancub merits to sit in that rank"
"Tim Kelly’s lighting design makes excellent use of the Barn’s new lighting rig [and] blend[s] seamlessly with the rest of the production"